In the past couple years pickling has experienced a resurgence as chefs and foodie-adjacent hipsters discover the ease and joy of pickling. Like almost all things trendy, pickling has an old and global legacy. As evidenced by every Korean restaurant, Jewish deli and the aforementioned Taqueria Los Comales, pickles are an international condiment. Each culture does them a little differently, with varying degrees of spice, fermentation and even the addition of ground shrimp. But pickling, as easy and delicious as it is, is really about preservation. Sealing vegetables in a slightly flavored acid is one way to fight off the winter-vegetable blues, which comes in handy for college students in the race to consume vegetables before they turn moldy and tired. Pickling is great for taking half a vegetable haul and preserving it for later. My vegetable crisper, once the coffin for at least a quarter of my vegetables, now offers up plenty of options for pickling, the first of which are these lovely carrots, given an extra month of refrigerated life through the glories of preservation. Pickling is relatively easy and requires little more than vinegar, salt and a tightly-sealed vessel. A standard recipe, one which mimics the dill-pickle variety, relies on the addition of garlic, herbs and spices. What those herbs and spices are, even the garlic, is really up to the pickler. I combined a bit of thyme and a lot of red pepper for a good degree of kick, but you can and should follow whatever whim your pickling heart leads you on. While I believe everyone should pickle, I am a bit biased. On the center of my parents’ mantlepiece is a great stone-ware vase and lid. Ornamented with swirling blue floral designs, it looks a bit like a graceful, oversized urn. In actuality, it’s a jar for pickled plums that my grandmother used to bury in the ground way back when. Which is to say that, in a way, my family worships pickles. Not that anyone has ever really pickled anything in my house before. But the legacy is there, and who am I to argue with my ancestors? 15 small carrots, (about 2 cups) or other pickling vegetable like cucumbers, green beans, onions, cabbage, beets, radishes or cauliflower. You can pickle almost anything. 1. Trim all but 1/2 inch of the carrot greens off each carrot. Wash and scrub each carrot to remove dirt. Peel if desired. 2. Prepare an ice bath by filling a large bowl with cold water and ice. 3. 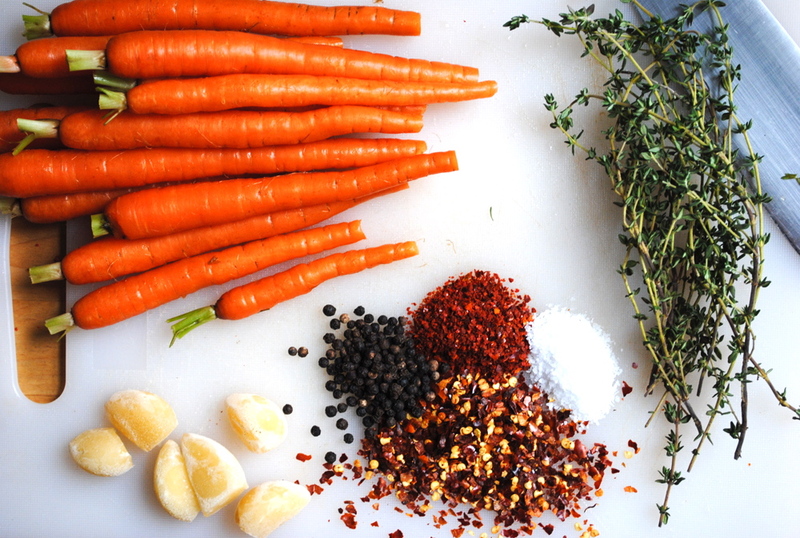 Bring a pan of water to a boil and blanch the carrots for 1 minute. Immediately remove from the water and plunge into ice bath to halt cooking. 4. 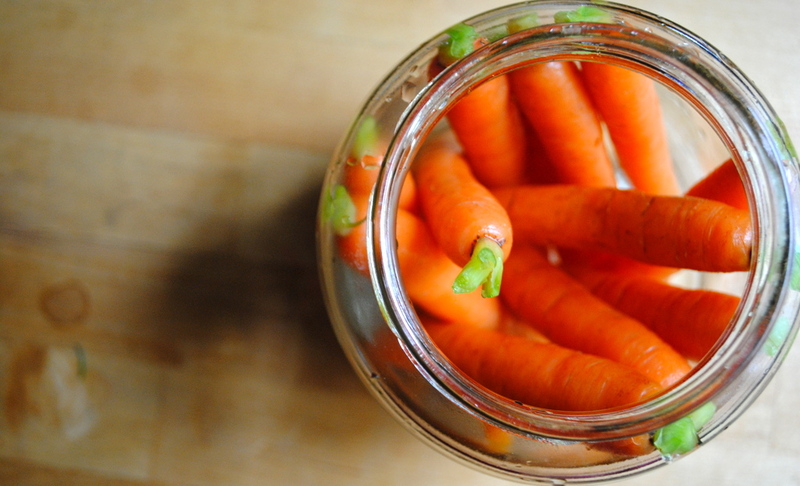 Dry carrots once cool and fit into pickle container. 5. Press the garlic, or mince with a knife, and mix with the herb sprigs, spices, sugar, salt, water and 1 1/4 cup vinegar in a large saucepan. Bring to a boil and then reduce heat to a simmer. Simmer for 10 minutes to reduce the liquid. 6. Remove pickling liquid from heat and let cool completely. 7. Add the pickling liquid and the remaining 1/4 cup vinegar to the pickling container. Refrigerate for at least two days before serving, though they reach maximum deliciousness after about a week. Pickles keep up to a month in refrigerators.